Description: Curious miniature map of New Zealand and the Solomon Islands showing the two landmasses as being connected. Based on the discoveries of Abel Tasman. Coloured. Description: Pacific. Black and white sea chart from the West coast to an early Australia before the mapping of the east coast. 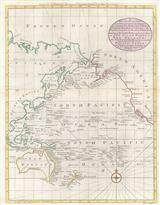 Description: Reduced version of Bellin's chart of the South Pacific. 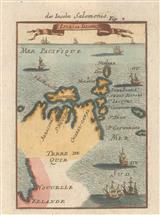 Includes an interesting depiction of Eastern Australia, a faint outline of New Zealand, and the Pacific coast of South America. 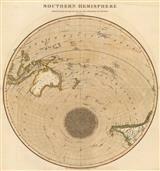 Description: Fascinating and important map of the Pacific Ocean, perhaps the earliest attempt to map the ocean's depths. A fine example of French theoretical mapping. Original hand-colour. Description: Pacific Ocean including New Holland, New Zealand and Hawaii. Coloured. Description: French Polynesia (the Society Islands), including Tahiti and Bora Bora. The tracks of the explorers Byron, Wallis, Carteret, and Cook are marked. From Cook's Voyages. Coloured. Description: West Coast and Pacific. Route of La Perouse. Coloured. Description: The Philippines to California. Coloured. Description: The Pacific Ocean based on Arrowsmith. Description: Large scale black and white wall map of the Pacific on four sheets joined. Shows latest discoveries. Description: Islands in the Pacific Ocean. Original colour. Description: Pacific Ocean with emphasis on Australia and insets of New South Wales and Tasmania.